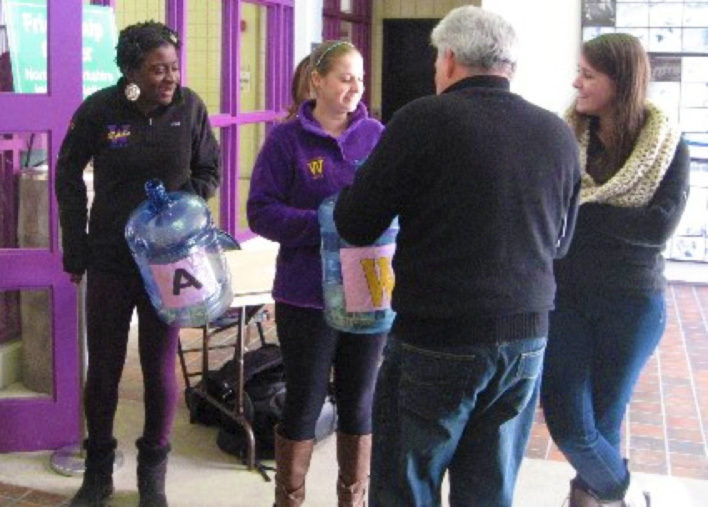 Recognizing that they are leaders in the community, Ephs have focused on making an impact. Community service has become an integral part of Williams Athletics, with many of our student-athletes committing to give back to both the campus and surrounding community. On any day of the week student-athletes are giving back to the community; below is a list of some recent examples. Adopt-a-Highway program: Helping to keep America beautiful by adopting stretches of highway and pledging to keep them litter-free. Ephs have adopted Route 43. The Best Buddy Skate Program: A non-profit organization that pairs Williams students with local residents who have mental disabilities. Students host monthly barbecues and holiday-themed parties, go ice-skating with their buddies during January, and participate in other events throughout the year to help foster long-lasting, personable friendships. A Better Chance Clothing Drive: The clothing sale, which has become an annual fall event, helps to support six academically talented students of color who live in Williamstown during the school year and attend Mt. Greylock Regional High School. Briarcliffe Dinner: We serve dinner to the senior citizens at the Briarcliffe RV Club House. 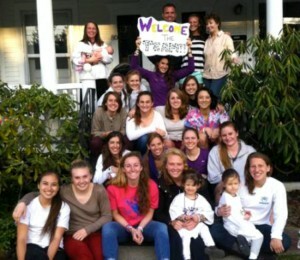 Elizabeth’s Hope: The Williams field hockey team dedicated its 2012 season to Elizabeth Minter and raised money for Elizabeth’s Hope, which supports brain tumor research. Food Drive: Proceeds donated to the Friendship Center food pantry in North Adams, MA. The Friends of Milne Public Library: Ephs volunteer by helping to sell used books and taking part in a silent auction and a café and bake sale, with proceeds donated to the Spruces following Hurricane Irene. Girls on the Run: Girls on the Run is a youth development program for girls in 3rd through 8th grade. The program teaches life skills, builds confidence, and establishes a lifetime appreciation of health and fitness through dynamic, interactive lessons and running games. Girls and Women in Sports Day: Focus on developing and delivering equitable and quality sport opportunities for all girls and women through advocacy, leadership development, educational strategies, and programming. Hillcrest Toy Drive: Over the past seven years the Athletic Department and several Eph teams have supported the annual Hillcrest Toy Drive for the children at the Hillcrest Education Center in Lenox, MA. Jill’s Legacy (Lung Cancer Foundation): Carnation sale fundraiser. Kills for Karleigh: Fundraiser for Lymphoma Cancer Research. Lacrosse the Nations: Lacrosse the Nations unifies the lacrosse community to sustainably improve education and health while creating hope and opportunity for children in need. Matt Stauffer Cancer Run for a Cure: In memory of Matt Stauffer, a former member of the men’s soccer team, the run benefits the American Cancer Society. Pink at the Rink: Breast Cancer research fundraiser with Amherst College. Relay for Life: Communities across the globe come together at Relay for Life events to honor cancer survivors, remember loved ones lost, and continue the fight against cancer. Skate with Team: An opportunity for faculty, students, and local community members to skate with the women’s hockey team. Team IMPACT: Team IMPACT’s mission is to improve the quality of life for children facing life-threatening and chronic illnesses by establishing and expanding vibrant team-based support networks. In doing so, the team joins the child’s support team, supporting the child in his or her medical journey and beyond while also providing strength and support for children facing these adverse issues, and events. United Cerebral Palsy-North Adams, MA: United Cerebral Palsy (UCP) Association of Berkshire County has dedicated itself to offering supports and advocacy for any individual, regardless of disability, to pursue a fulfilling, self-determined, high-quality community life – a life without limits. The UCP mission is to advance the independence, productivity and citizenship of people with disabilities. UCP of Berkshire County is an affiliate of United Cerebral Palsy Association. Peace Valley Farm: The three-acre farm, nestled at the foot of the Taconic Crest range in Williamstown, grows vegetables and herbs that are regularly available in the dining halls at the college and at local restaurants. Ephs have volunteered on the farm and helped them prepare for winter. Walk a Mile in Her Shoes Fundraiser: A Walk a Mile in Her Shoes event is abundant with opportunities to get people talking. For preventive education, it helps men better understand and appreciate women’s experiences, thus changing perspectives, helping improve gender relationships and decreasing the potential for violence. For healing, it informs the community that services are available for recovery. It demonstrates that men are willing and able to be courageous partners with women in making the world a safer place. We volunteered and raised money for the event. WBCA Pink Zone Games: The WBCA Pink Zone initiative has raised a phenomenal amount of awareness for breast cancer, as well as a significant amount of donations for women’s cancer research. Win, Set & Match Against Breast Cancer Pro-Am Tournament: Local tennis players help raise money for breast cancer survivors by playing in a Pro-Am Tournament with members of the Williams College men’s and women’s tennis teams at the Bennington Tennis Center. Winter Carnival: Winter Carnival is a three-day celebration of the season organized by Williams students that involves the campus and local community. WISHES: Ephs work as tutors at Williamstown Elementary School. Words are Wonderful Parade: Words really are wonderful, and no one knows it better than the students of Williamstown Elementary, who spend an entire week celebrating words and literature. One of the most anticipated events is a parade of students dressed as their favorite characters from books. Youth Center Snowfest: The Williamstown Youth Center’s annual Snowfest fundraiser supports the center’s operating budget and provides scholarships for families to participate in Youth Center programming.